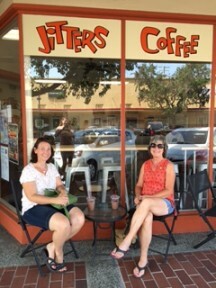 July 8, 2015 was the grand opening date for Jitters Coffee House in the heart of downtown Sanger, at 1315 Seventh St. It has both indoor and outdoor seating, and had patrons partaking of both when I visited. 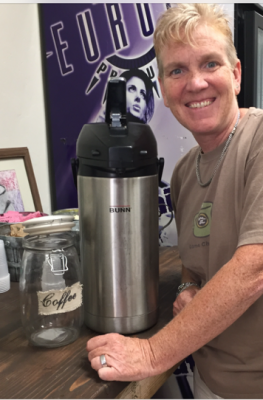 I sat with owner Karen Gaines to uncover the story behind Jitters. 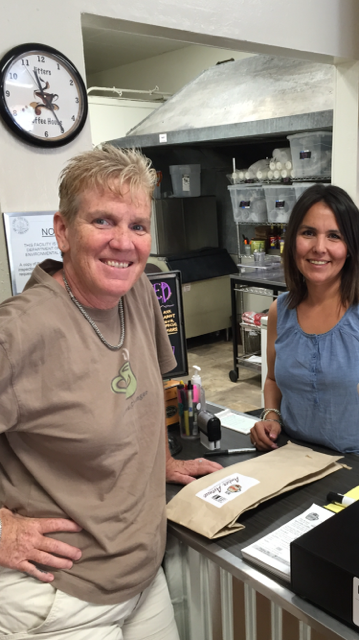 Enjoying their morning pick-me-up – mother/daughter Carrie S. and Cheryl M.
A Fresno native, she has worked in Sanger for 17 years at her other business, Fun Works. That business works with the Sanger Elementary schools by providing entertainment at school rallies and assemblies. Her other passion is coffee. She loves the smell and says that is her go-to comfort zone. Gaines once ran a side-business, a mobile coffee cart, for four years, serving coffee at high school football games. 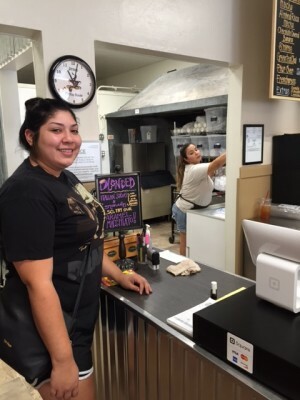 Because of her gregarious nature, love of people, and love for coffee, she wanted a physical place that would be welcoming, comfortable, and as home-like to customers as possible. 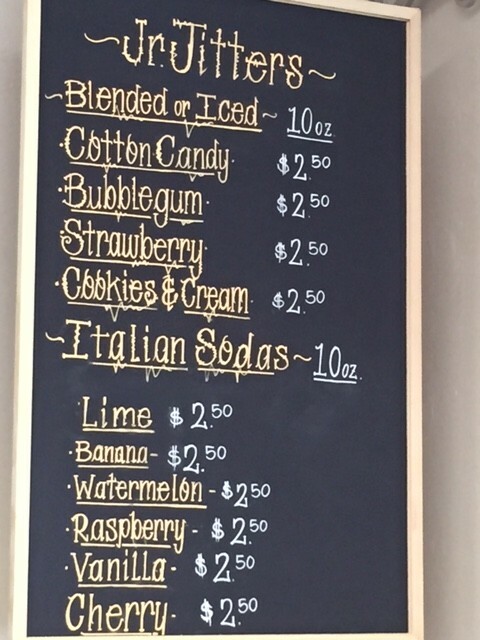 •	There is an entire menu board for children, the Junior Jitter Menu, where for 10 quarters a child can buy blended drinks and Italian sodas. •	She offers a delivery service free with any minimum purchase of 10 dollars within the shop’s local parameters. •	She offers a customer loyalty card: buy only five drinks, get one free. Jitters also has its own house blend, a medium-to-dark roast that’s bold but smooth, Gaines says. It is roasted by Amber Avenues, a local company just outside of Sanger, and then used within 24 hours of production. 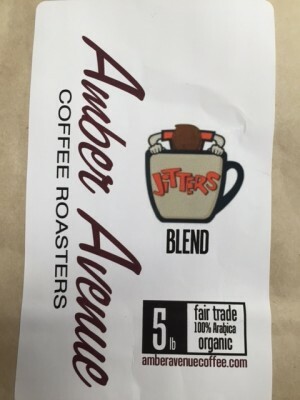 Customers have been asking to buy their own Jitters Blend Bag, but may have to wait a bit while particulars are worked out. Currently the coffee house features Firehouse Pastries from the nearby Quail Lake neighborhood: Cronuts, scones, cinnamon rolls, and various types of croissants. Jitters also carries I (heart) strawberry pizzas. Trying to keep everything as local as possible, all of her employees are Sanger natives. She is proud of them, calling them “brilliant.” She says they are always complimented by patrons for their helpful, friendly service. Gaines went on to say that while she is actively involved, she doesn’t micro-manage, so her employees feel they have a vested interest in creating the best workplace possible. I asked Katherine for a To-Go Menu, and mentioned I really wasn’t a big coffee drinker. 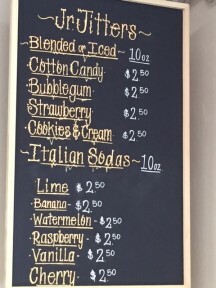 She immediately pointed out that Jitters serves Mango and Peach green teas, as well as flavorful Italian sodas. Katherine also revealed some of the house secrets, such as “We make our own whipped cream every morning, and we offer soy or almond milk to individualize each person’s drink so everyone is happy.” She also said that kid’s favorites were cotton candy, and cookies and cream blended drinks; while the adult fan favorites were Almond Roca Mocha and S’mores. 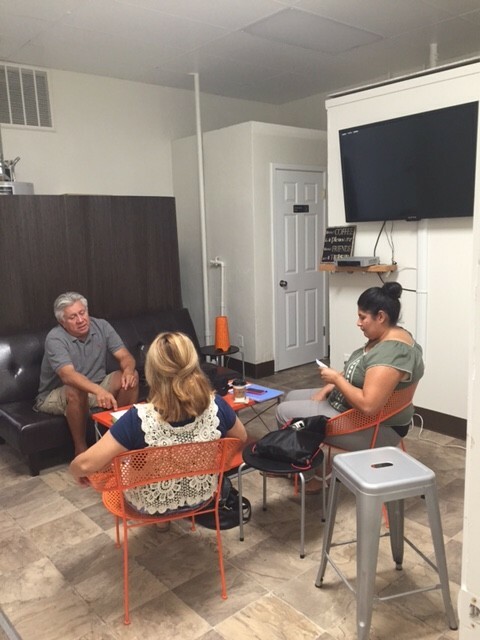 Wandering around the shop, I explored the back room, an additional, casual hang-out space anyone can use. This particular morning, I came upon Executive Director David Gonzalez of Community Life Garden, and two specialists from the County of Fresno Dept. of Public Health’s Office of Policy, Planning, and Communications’ Champions for Change Program, Brenda Flores and Carmen Escobar. I found that people really were welcomed to work at a place that was conducive to business (Jitters has wi-fi). At the time, Brenda, David and Carmen were working on a plan to create a community garden in Reedley that would also benefit all the citizens of Orange Cove and Dinuba as well. Jitters Coffee House will also play host to Art Hops the last Saturday of every month. To kick off their first event, 11-year-old daughter Jaden will have her landscape photography on exhibit. In between our conversations, people came and went, each one greeted by name by Gaines, each one saying goodbye happily. It was then I realized this was also a comfort station, a place to not just get filled up by yummy drinks of all kinds (iced, blended, or hot), but to actually be filled with the good energy and human comfort offered by friendly staff, or their caring boss, who seemed to know everyone. Bringing our interview to a close, I asked Gaines where she inherited her positivity. She replied, “parental influence.” Her father, now 92, told her to always do what makes you happy—and that, whatever you do, especially things that have to be done, to do them with a smile. One of the only retail items offered for sale at Jitters is the Seeds of Happiness tokens, brightly colored clay faces emblazoned with a smile. Holding one up, an orange one, which happens to be Jitters’s signature color, Gaines exclaimed, “They’re like me!” As they are intended to be given to someone to encourage a smile, I would have to agree. They’re frequently purchased by teachers to brighten an especially worthy student’s day. 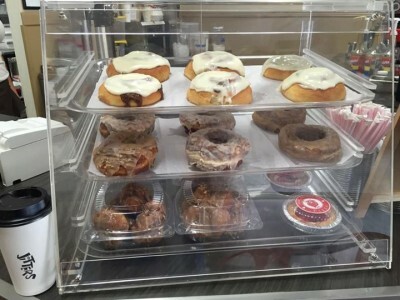 Gaines future plans include expanding the menu to offer sandwiches and savories, possibly by early fall. I left the coffee house, and contrary what the name, Jitters, would imply, I walked out with a sense of calm and peace, happy to head home to start my story of a warm, welcoming coffee house, in Sanger, California. Open Monday through Saturday (closed Sunday) 7 a.m. – 7 p.m. I guess Austin is too far to commute for a pastry.